Este concerto reúne alguns dos músicos jovens mais proeminentes das cenas nova iorquina, londrina e portuense ou portuguesa. No entanto, o que os une é o gosto pela música, muito dito pelo jazz, e tocar partilhando e desenvolvendo esta linguagem que ainda não mostrou limites nem por força da lógica. Assim teremos Allan Mednard na bateria que já gravou o disco Zero liderado por João Guimarães, Eduardo Cardinho no vibrafone, que tanta música nova nos tem trazido e que coliderou este processo com Guimarães, e Max Luthert III, o baixista mais requisitado de Londres. 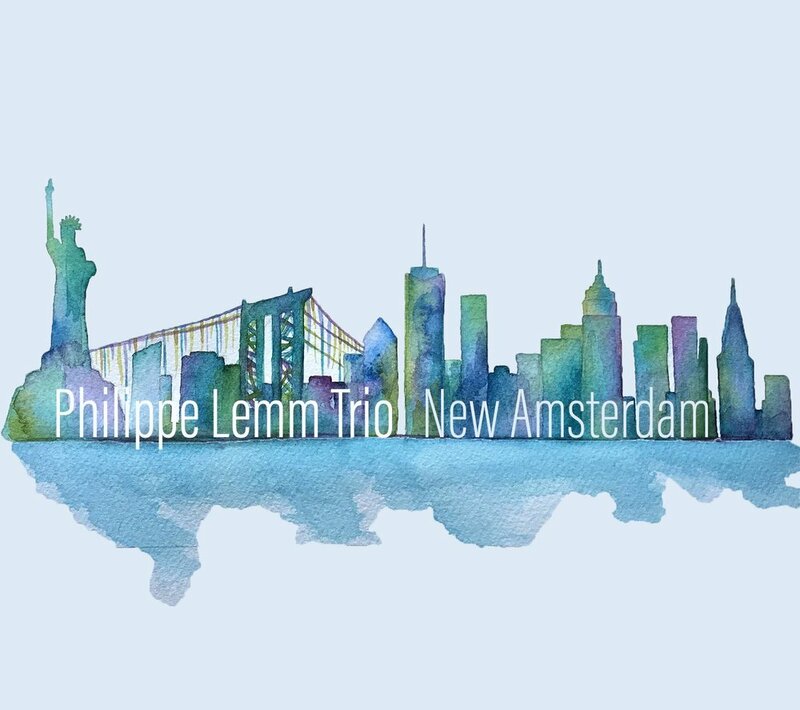 The Philippe Lemm Trio, comprised of Dutch drummer Philippe Lemm and American pianist and bassist Angelo Di Loreto and Jeff Koch, respectively, houses a dynamically creative, exciting, and fresh sound, spanning multiple influences from all of its members. The trio won the International B-Jazz competition in 2015 and the group’s performance of Di Loreto’s original composition “Salt Road” earned an ASCAP Jazz Composer Award in 2013. The three musicians met during their master’s degree at Manhattan School of Music in 2011, where they quickly realized that they had an undeniable musical chemistry and understanding of each other’s musical personalities. They began performing together in and out of the school, and eventually did a residency at the newly-formed True School of Music in Mumbai, India in August- December 2013, where they taught, gave masterclasses, and toured with Bollywood music star Shilpa Rao. Musically, the group’s sound draws influences from the classical, jazz, and prog rock idioms, to name a few. Their sound is captivating and exciting, and always strives to be fresh, original, and moving. 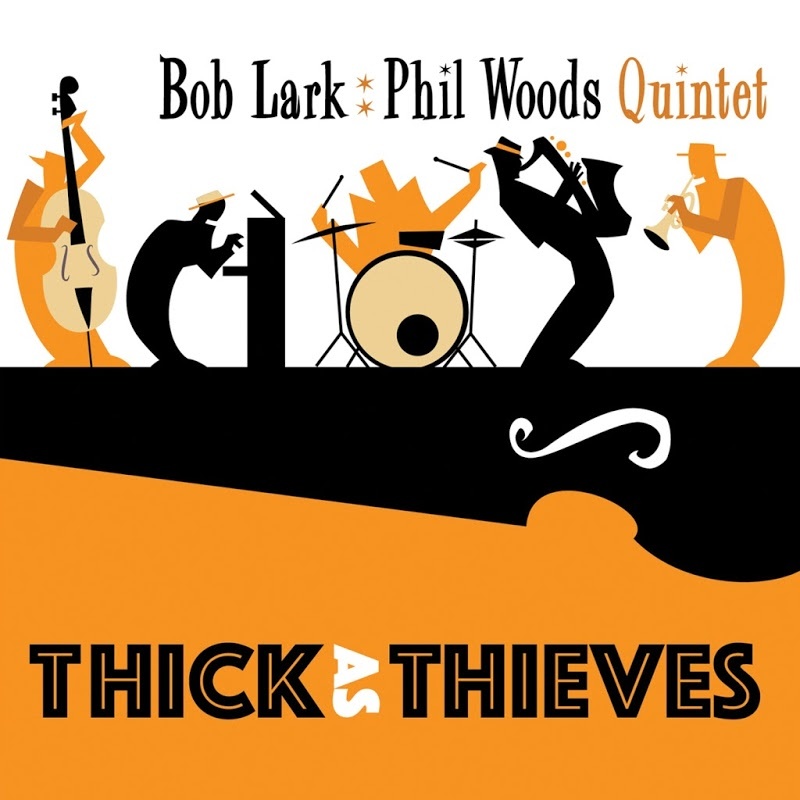 Thick as Thieves is the third, and final, recording by The Bob Lark/Phil Woods Quintet, and features some of Phil Woods' finest and most dynamic alto saxophone solo improvisations from his storied and distinguished career. Captured "live" in 2009 at Chicago's legendary Jazz Showcase, the rhythm section of Jim McNeely, Steve Gilmore and Bill Goodwin combine forces with Bob Lark and Phil Woods to produce music with an electric swagger, interplay, nuance and soul. The final recording - and arguably the best - by The Bob Lark/Phil Woods Quintet, with Woods' solos demonstrating an intensity and mastery associated with his very finest performances. 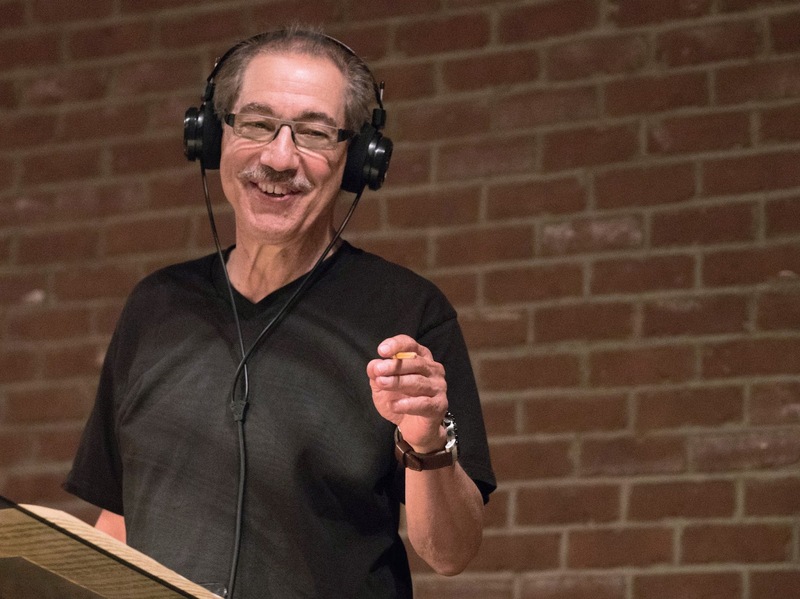 The spirit and "live" energy of the recording at Chicago's Jazz Showcase is palpable, with each member of the band demonstrating dynamic soloing and mature ensemble interaction. Five selections feature the Quintet - Yardbird Suite, I Love You, First Steps, All the Things You Are and Billie's Bounce, while Winter's Touch and Rhythm-A-Ning feature the Quartet of Lark, McNeely, Gilmore and Goodwin. A trio session of standards to match the best of the late ‘50s classics, with exquisite drumming by Phil Stewart. 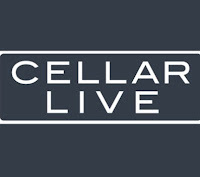 The name of this excellent jazz label Cellar Live conjures up a pleasing image. It is a Saturday night, we descend the few stairs, slip a sawbuck into the can at the door or give it to the man with the tattoos, and seek a table facing the bassist. Anon the frothy refreshments appear and the three musicians take their places. One, two three… and the air is quickened by tone, feeling, idea. Hush, chattering youngsters, for these are musicians of outstanding merit. And so the glorious evening rolls on to its conclusion. And ascending the few stairs into the evening air we know the world to have been repaired by art and something like love. Preserve the image folks, for the jazz clubs are not well. Like the macaw and the whooping crane they have retreated to the verge of extinction. Even in Portland, Oregon, a town oversupplied with musicians, the last jazz club closed its doors in 2016. 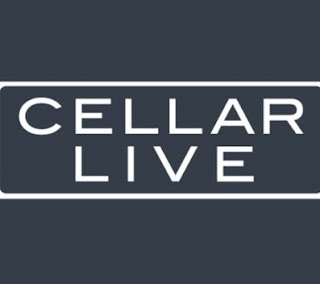 Cellar Live productions is dedicated to preserving the art form and nourishing the creative impulse. 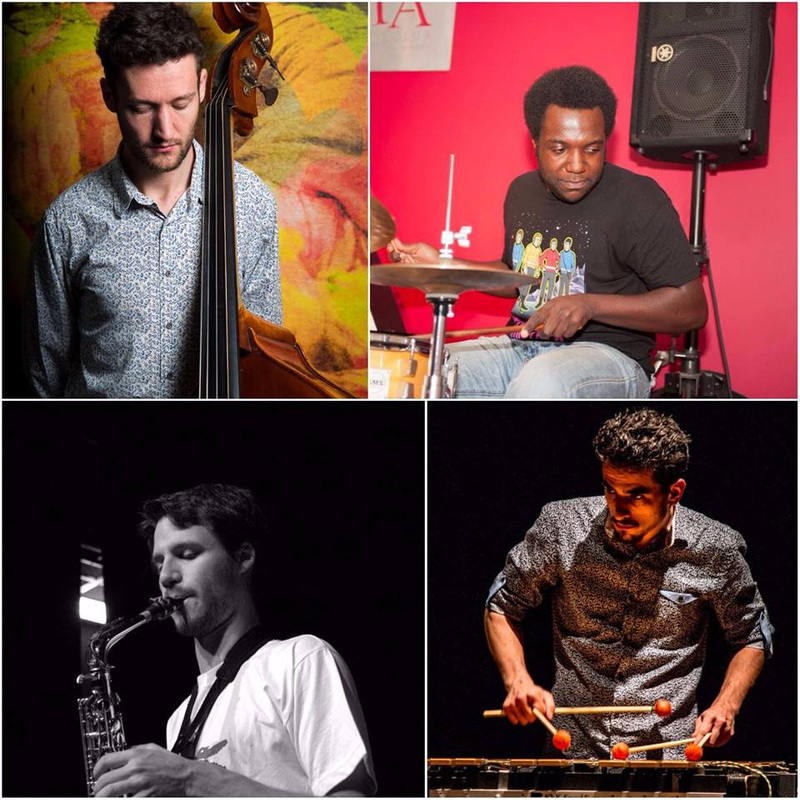 It helps that they draw on the considerable talent of the still thriving New York Jazz scene. 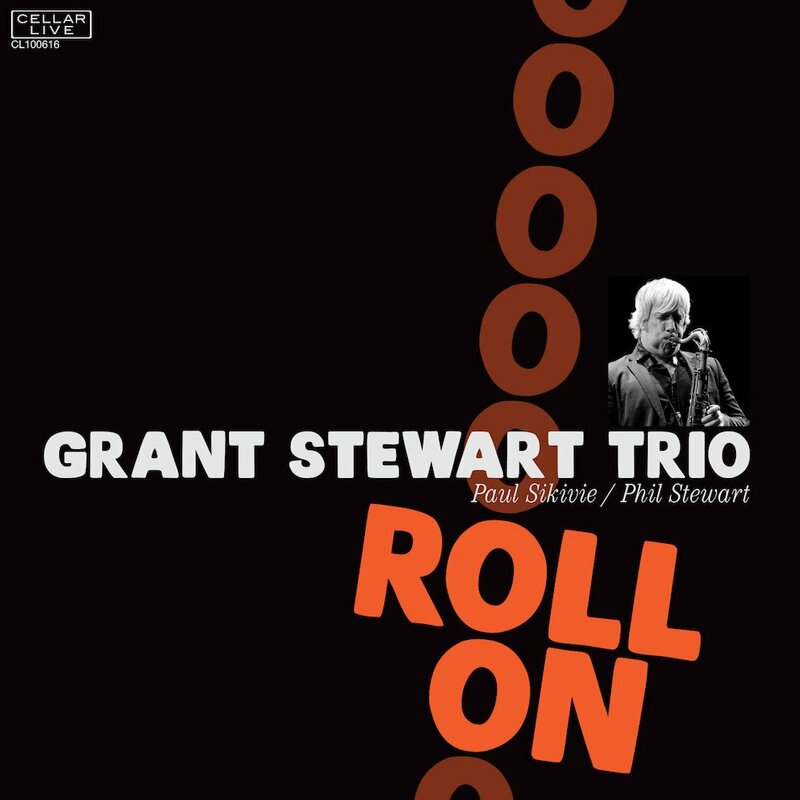 On the record under review, we have Grant Stewart, a transplanted Canadian (Scarborough, Ontario) leading a trio that includes his younger brother Phil Stewart on drums as well as Paul Sikivie on bass. We at Audiophile Audition were deeply impressed by a recent Cory Weeds recording on the same label, and it is a good sign that he is the producer of this session as well. Of the many good things that can be said about this record, the first is that it assembles nine stellar tunes, none overly familiar. Three bebop charts by Fats Navarro, Bud Powell and Elmo Hope find the trio in an early ‘50s groove. 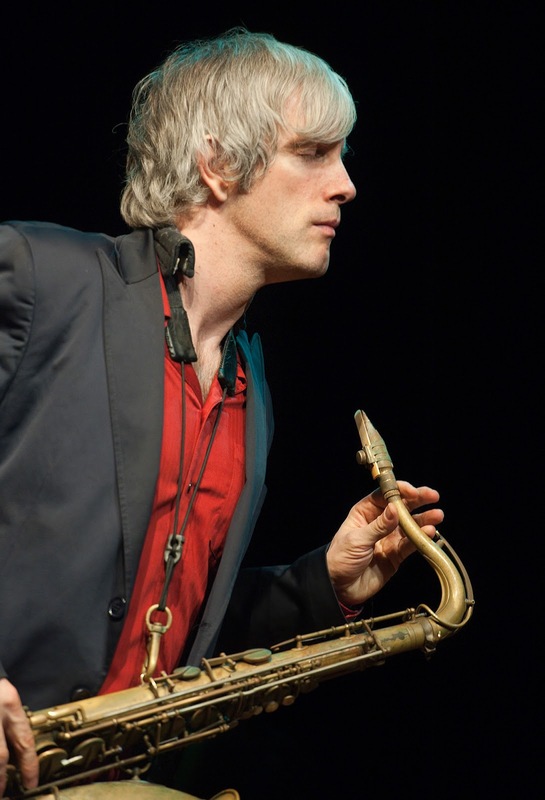 The tenor style, however, tends towards a relaxed playing off the beat rather than the impatient straining forward which is characteristic of the style and gives bebop its neurotic zaniness. The exemplar here, as cited in the notes, is the Sonny Rollins at his most relaxed on one of his Riverside trio outings. Although, Stewart’s tone is not as hoarse as his predecessor. The drumming is outstanding throughout, but on Fats Flats the traded fours attain a magnificent hilarity of inspiration. Un Poco Loco balances a straight tenor statement of them with more melodic drumming, the brothers playing together with accord and humor, while the bass holds things together. It is an extravagant seven minutes of fun and inspires me to nominate this track for an award as Best Drumming Performance of 2017. On the first of three ballads, Here I’ll Stay, the tenor shows great confidence in the melodic line, playing almost without embellishment. His improvisational choruses seem to plumb the meaning of the lyric, rather than to stir up harmonic agitation. On Just As Though You Were Here, he leaves ample space for the rhythm mates who share the leader’s fine sense for both timbre and melody. On Thinking of You, the tenor directs his thinking apparatus toward the construction of some fine thematic choruses with nary an excessive note. Do You Know What It Means to Miss New Orleans channels more mid ‘50s Sonny. Slow but not lethargic, the ballad drifts on currents of longing but the sound of the tenor is so assuring that we don’t feel forsaken by time or loved ones. The title track, Roll On, is just one more display of group rapport on a fine chart. After You’ve Gone is taken at a bright clip; the bass exerts both thews and sinews on a brisk trot, while the saxophone flies ahead on a torrent of crisply articulated 16th notes, reminiscent of the great Sonny Stitt. This trio has made a deeply satisfying recording, relying on the elements of form and a communication which are products of a specific ‘50s musical aesthetic yet are flexible enough to allow for a spontaneous and fresh treatment like this. You would be stupendously lucky to see a trio like this at your local cellar jazz club. Kudos to the musicians and the producers for a stand-out release. "The intriguing trumpeter pushes expressive possibilities in the real of big band culture, armed with a progressive attitude, yet also with clear roots in tradition and timeless musical values." Though he was only 43 years old when he passed away suddenly in 1975, Oliver Nelson left behind a body of work that is staggering in its breadth and depth. 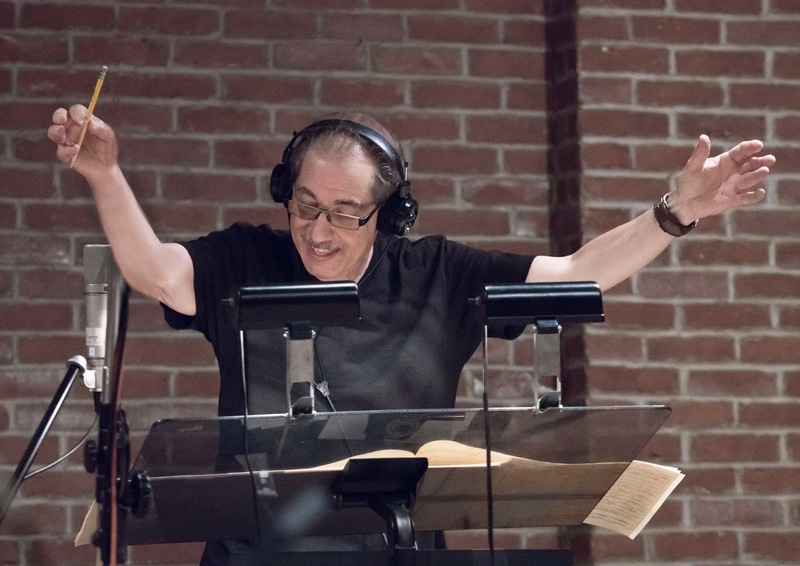 More than 40 years later, his influence as a composer and arranger is still felt, though Nelson's name isn't mentioned as often as his innovations might merit. 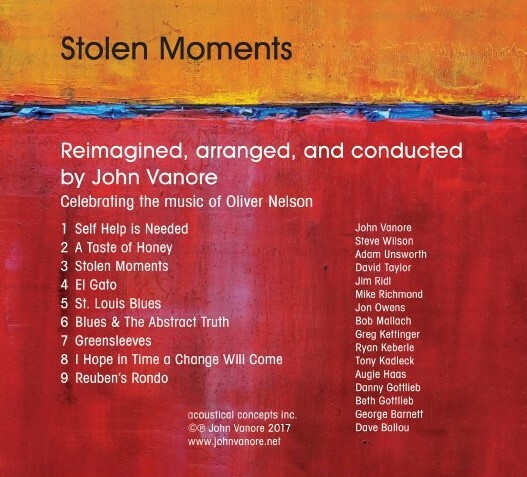 Bandleader/composer John Vanore is determined to change that with Stolen Moments: Celebrating Oliver Nelson, the first large ensemble recording of Nelson's music in decades. Named for Nelson's best known composition, Stolen Moments (due out August 18, 2017 via Acoustical Concepts) revisits nine pieces that were either composed or arranged by Nelson over the course of his prolific career. Not even the most iconic jazz artists can boast such a wide-ranging resume: Nelson is revered for his work with jazz greats like Thelonious Monk, Count Basie, Clary Terry, and Jimmy Smith; his own classic albums, The Blues and the Abstract Truth (1961) and Afro/American Sketches (1962); as well as soundtrack work for TV (The Six Million Dollar Man, Columbo) and movies (Alfie, Last Tango in Paris). "Oliver Nelson must be revered as one of the major jazz composers," Vanore insists. ""My charge was to reimagine and arrange for a unique ensemble in the spirit of Oliver, and invigorate the repertoire." For Vanore, this mission - and the resulting album - is deeply personal. Nelson played a pivotal role in determining the bandleader's path in life. Though he'd played the trumpet since the second grade, Vanore was convinced that working-class guys from Delaware County, PA, couldn't become successful musicians. "That was like saying you want to be a Hollywood actor," Vanore laughs. But then he encountered Nelson's music first-hand one summer via the National Stage Band Camp at Indiana University in Bloomington, with Nelson himself conducting the band. "I'd never heard anything like that," Vanore recalls, obviously still dazzled almost 50 years later. "It was just unbelievable. It was that kind of moment where you're just taken by everything about it. His writing was never bombastic big band writing; there was so much more content, and that touched all my buttons as an analytical thinker. That was the turning point for me." As of that moment, Vanore was no longer an engineering student with a future in the sciences; he was a musician destined to arrange thoughtful, inventive large ensemble music. When he founded his own band in the early '80s, he named it Abstract Truth after Nelson's best-loved album. Vanore never strove to sound like his idol, though, which would have run counter to the spirit of Nelson's ground-breaking and constantly evolving life's work. "His main influence was have your own identity and be original," Vanore says. Through the decades Vanore has rigorously adhered to that message, following his own path in music and performing his own compositions almost exclusively. His Philadelphia-based band Abstract Truth has a unique make-up, with French horn and just two saxophones in place of the usual woodwind arsenal, a line-up replicated with the all-star ensemble he's assembled for Stolen Moments (adding a second French horn): saxophonists Steve Wilson and Bob Malach; trumpet players Tony Kadleck, Augie Haas, Jon Owens and Dave Ballou; Adam Unsworth and George Barnett on French horns; trombonists Ryan Keberle and Dave Taylor; and the rhythm section of pianist Jim Ridl, bassist Mike Richmond, drummer Danny Gottlieb, guitarist Greg Kettinger, and percussionist Beth Gottlieb. Vanore left the podium to take a heartfelt trumpet solo on the title track. This solo is, in many ways, the culmination of Vanore's musical journey, a thanks to the man who inspired it all. Though the album is dedicated to Nelson, it also maintains that insistence on originality and identity. Necessary ingredients were instilled in Vanore through study with the great Philadelphia teacher Dennis Sandole, whose most noted student was John Coltrane. Instead of replicating Nelson's charts, Vanore reorchestrated the music in his own voice, taking an approach similar to the one that Gil Evans famously applied to Miles Davis' Sketches of Spain and Porgy and Bess. "I would never take Oliver Nelson's arrangements and record them," Vanore says. "This isn't a ghost band. I kept the identity and essence of Oliver's music but made them my own. I'm trying to tell his story with my words." The repertoire Vanore chose ranges from throughout Nelson's career. "Repertoire was key," he explains. "I wanted to create an impactful collection of material that would demonstrate Oliver's various points of view." The album opens with the cool swing and powerful explosiveness of "Self-Help is Needed" from Nelson's 1969 album Black, Brown and Beautiful, which offered Vanore, a life-changing introduction to Nelson's compositional abilities. The same album is also the source for "I Hope in Time a Change Will Come," on which Steve Wilson's performance evokes a timeless cultural cry. The much-recorded '60s pop standard "A Taste of Honey" is followed by the immortal title track; the rare treasure "El Gato" was written in homage to Argentinean saxophonist Gato Barbieri. Taken by Vanore's band at a poignantly eloquent slow pace, W.C. Handy's classic "St. Louis Blues" was an obvious choice for St. Louis native Nelson, while the title cut from Blues and the Abstract Truth is a prime example of Nelson's ahead-of-its-time modernism. Vanore masses the horns to lead into the timeless folk song "Greensleeves," which Nelson recorded on 1968's The Sound of Feeling. Finally, "Reuben's Rondo" - the song that changed Vanore's life those many years ago - closes out the album with jaunty, muscular swing. 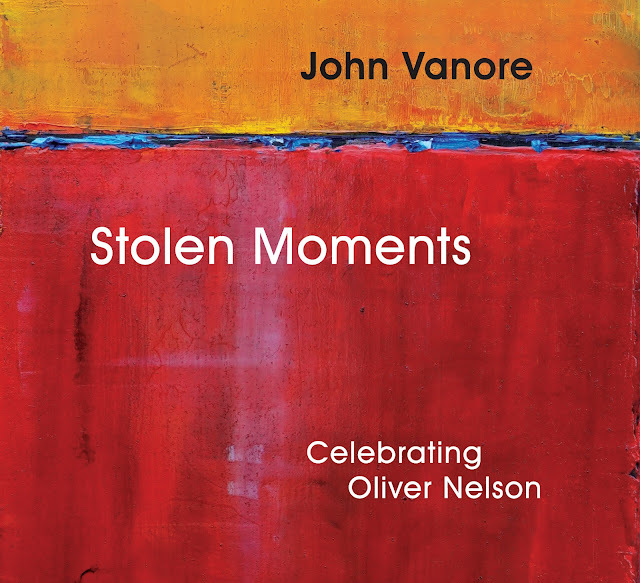 For Vanore, the title Stolen Moments has a dual meaning. On the surface, of course, it tips its hat to the jaw-droppingly beautiful, achingly expressive tune that will forever be Oliver Nelson's most lasting legacy. But it also carries the bittersweet acknowledgement of the legendary composer's life, cut far too short. "This year would have been his 85th birthday," Vanore says. "A lot of great jazz artists are still active at 85. When you consider the book he wrote, you have to wonder what his output could have been if he had lived."